In this series of blog posts, we tell you methods to perform social media audit for free. In this first part one, we discuss social media competitive audit. It takes a lot of time and energy to build a social media strategy. After you start implementing that strategy, you need to make sure that you are going in the right direction. The best way to do that is to perform a competitive social media audit. Competitive social media audit? Sounds complex, doesn’t it?. But actually, it’s easy if you know how to do it. Nowadays, with the help of social media auditing tools, you can perform your competitive audit within seconds. As we have already discussed in social media benchmarking guide , competitive audit will help you create the right benchmarks for your social media performance. What is a competitive social media audit? Competitive social media audit is a technique which helps you identify how good or bad you are performing on social media as compared to your competitors. The text in bold letters, casual it may seem, is the crux. Self-audits, as you will see in the next part, only compares ‘you’ against….yes, you guessed it right, against ‘you’. So, let’s assume on a scale of 1-100 of performance, if you were doing 1 last month and are doing 2 right now, it might seem of jump of 100%. But practically, it’s not much. And secondly, it doesn’t take into account how behind you are from your competitors. Hopefully, you already have an idea of your main competitors. But there’s more to it than that. Choosing the main competitors seem like an easy thing to do but it’s not. One needs to be very cautious of the fact that choosing the right competitors is the key to the whole process. You can start by asking how many competitors you should choose. In general, 3-5 competitors are enough when you are auditing once a month. But if you are auditing weekly then one competitor will be sufficient. Again, you should choose your competitors with great care. If you are selecting a set of five competitors then you should choose one local competitor from your city, two state competitors, and two national level competitors. This set of five competitors will be sufficient when you are operating nationally. 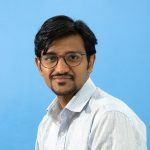 But if you are operating international then you have to ditch the local competitors and choose one state-level competitor, two national level competitors and two international level competitors. Tip: Try choosing all competitors as direct competitors – competitors operating exactly in the same industrial domain as yours. Once you have a list of the competitors you want to audit. Next step of the process is to identify which social media channels you should audit. It’s not necessary that all your competitors are active on only those platforms which are actively used by your company. In that case, you might want to audit only those platforms on which your company is active. But in my experience, auditing those social platforms on which you are not active but your competitors are may open up new frontiers. And give you new campaign ideas. Tip: When you are comparing cross-channel (addition of all social media platforms) performance then only add those platforms on which every company is active. Some metrics should always be in an audit, even though your objective varies. For instance, brand activity, total fans, or change in fans from a reference date. But some metrics are more crucial for one industry while in other it’s not. These industry-specific metrics can be omitted in those audits where they don’t add much value to the overall audit report. So, once you are sure which metrics you want to include you can actually begin with the audit. Tip: Don’t forget to include top performing content. It will help you create a better content strategy for social media. You can use social media competitive analysis tools available in the market to do this. These tools will help you create your competitive social media audits within seconds. However, most of these tools are paid. If you don’t want to spend on paid tools, you can get these audits using some free competitive audit tools. Here are some of them. 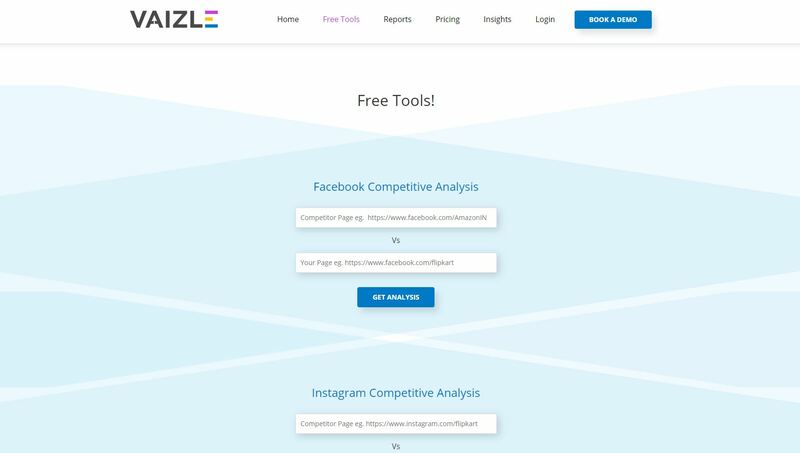 With Vaizle’s free auditing tool, you can do a quick competitive analysis with one of your competitors. First scroll down and select the social media platform you want to perform the audit for. Then enter your and your competitor’s page URL and click get analysis. And you will get a comparison of your performance versus your competitor’s performance. Vaizle will give you a week by week analysis of last 28 days of the data. You will get data for brand activity, brand engagement, and most successful content. This audit will help you decide what type of content you should post on your social media channels. It will also give you brand engagement breakdown for any specific platform. Socialbakers provides a free competitive audit for Facebook and Instagram analytics. There is another tool for Facebook ads performance prediction which can help you decide how much you need to spend on Facebook to achieve your goals. It also provides free twitter analytics tools. To get started with audit, you have to click on unlock tools and fill the required details. Once, you had filled the form then you can select the tool you want to use. After selecting the tool, you can enter the URLs of the account. Once you enter the details, it will give you data for brand activity, brand engagement, and brand response. Pro: Report will be emailed in PDF format. Tip: You can only compare two competitors at a time using these free tools. To get a comprehensive analysis you have to enter this data manually into excel sheet. That’s how easy it is. Please let me know how helpful it is for your business. If you have any questions, suggestions or queries please let me know in the comment section.